A London Underground station closed for nearly three years has reopened. Blackfriars station was shut as part of the £5.5bn Thameslink upgrade project. Improvements to the Tube station include increased capacity, a bigger ticket hall, refurbished platforms and step-free access. The work is also part of a £350m project that has seen Blackfriars become the first mainline station to span the River Thames. The Thameslink upgrade means trains running from Bedford and Brighton will use a 12-carriage service instead of eight and will eventually lead to a more frequent service. 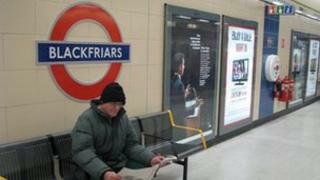 Closed in March 2009, Blackfriars Underground station is now able to accommodate up to 60% more passengers a day. Howard Collins, chief operating officer at London Underground, said: "The reopening of the newly renovated Tube station is fantastic news for our customers, who can now reap the benefits of the huge improvements that have taken place at Blackfriars." He said 40,000 currently use the station each day. "[That number] is set to grow significantly and I'm sure that all who pass through will find the improvements have been well worth the wait," Mr Collins added. The new Blackfriars mainline station will be fully open and operational by this summer.